Blend the cheese triangles and caprino cheese together in a bowl. Add the chopped herbs and 30 g of chopped hazelnuts. Spread the cheese mixture on a sheet of baking parchment and roll it up to form a log. Leave in the fridge until it is firm, then remove the baking parchment and roll the cheese log in the remaining chopped hazelnuts. Cut the cheese log into 3 cm thick slices and arrange on a serving dish. Decorate with tender celery tops or whole hazelnut and basil leaves, if you wish, and serve. The same cheese and herb mixture can also be used as a filling for short crust pasty tartlets or as a spread on sliced bread topped with a slice of smoked salmon or some chopped toasted hazelnuts and pink peppercorns. Serve as a starter with some vegetable crudités. It also makes a perfect summery single course if served with a big colourful salad. Sauvignon Friuli Aquileia DOC Superiore or Chianti DOCG. If you like garlic, you may want to try cutting some (the quantity is up to you) into tiny pieces, to mix with the hazelnuts: it will give the rolls a stronger taste. 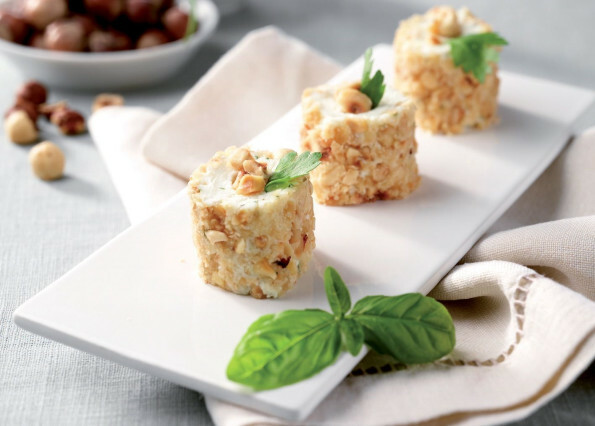 If you are thinking about a light, savoury appetiser, then this is just the right recipe for you! Although mainly made of milk, goat's cheese and Parmigiano Reggiano are known for being easily digestible: the first one thanks to its shorter fat molecules compared to cow's milk, the second one because it contains 7,5% of free-form amino acids, which need no digestion. In fact, they are already pre-digested and ready to produce all the enzymes needed for optimal food digestion, thus speeding up the process. Combined with the hazelnuts and fresh herbs, these cheese starters will brighten up your meal and satisfy your taste buds!